THE words "champion” and "gentleman” have often been used when describing Peter Cutmore. Sadly, those words are now being used in messages of condolence to the Cutmore family. Pete "Cutty” Cutmore died last week after a battle with illness. He had been a local baker since he was 15, completing an apprenticeship in his father's bakery, Mac's Cakes, which was located where the National Bank stands today. 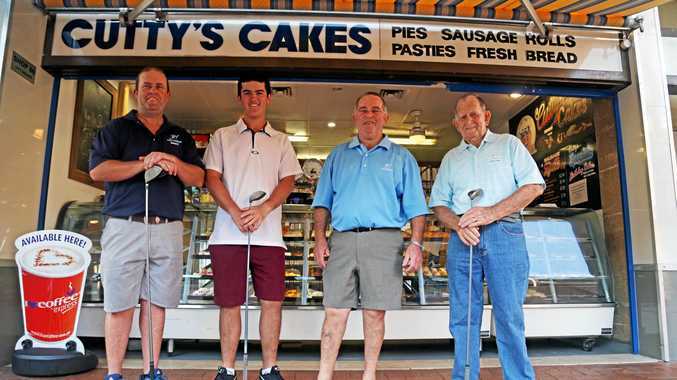 When it was time to branch out, Peter opened Cutty's Cakes in the heart of Coffs Harbour along with his wife Kaylene. Later his adult children, Bec and Shane, joined the popular family business as bakers. "He was a champion, always there for you,” Bec Cutmore said. "A real loving family man, a good mate and just an all-round great man who was always up for a chat or a laugh. Locals were quick to take to the Cuttys Cakes Facebook page to express their grief and support for the family. The post received more than 250 messages and counting. "One of the world's true gentlemen. All Coffs Comets were very sad to hear the news. He was always up for a chat and a smile. A great man taken too early” - Steve Gooley. "Heartbroken for Kaylene and all the family, we have lost a wonderful human being” - Jenni Rose. Many locals either knew Pete in person or were fans of his pastries. A staunch Canterbury Bulldogs supporter, Pete often made blue and white cakes in support of his team. He loved a game of golf and was a club champion many times over. In his early days he surfed and played basketball and in later life took up bowls. The family is holding a public service at St. Augustine's Church on Friday at 1.30pm.